Seminar Insider – Here’s what they’re all about! Home|Blog|Uncategorized|Seminar Insider – Here’s what they’re all about! As a regular reader, you’ve probably seen us promote our Home Buyers Seminars. If you’ve never had the chance to attend one, here’s an insider’s peek into the recent Seminar held in Wells, Maine. First a bit of background: Katahdin has been holding Home Buyers Seminars at the Oakfield headquarters for many years now— usually 2-3 times a year. Many of our customers like to tour the facility where their homes are manufactured, and it gives us an opportunity to spend some quality time with people who are interested in building a log home. However, for many people, the trek to northern Maine is just not feasible. (After all we are up in the North Woods!) So, we decided that it was time to take our seminars on the road. So far, they’ve been an excellent way for buyers not only to learn about our company, but also to learn more about the ins and outs of designing and building their log home, lot selection, budgeting, financing and finding a dealer/contractor. So, what’s it like to attend a seminar? First, if you plan on attending a seminar, we suggest that you take a few moments to jot down some key questions you’d like answers for. That way if we miss something important to you in the presentations, you can get an answer right away. You’ll also want to contact Shannon Hersey at the Oakfield office [link], who can pre-register you for the event. This helps us have the right amount of seating, food, beverages, and transportation. 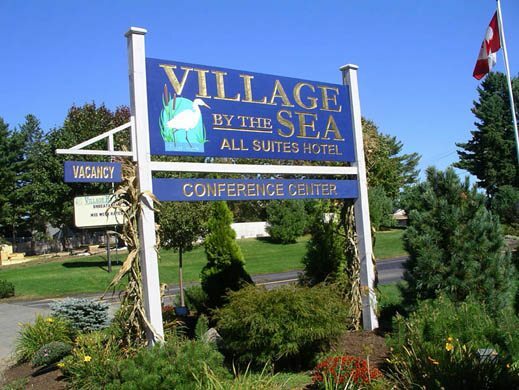 The most recent seminar in Wells, Maine, was held at the Village by the Sea, an all-suite hotel and convention center. It was easily accessible from Interstate 95, something we like to plan for each event we present. Upon entering the meeting facility, each guest was greeted by smiling Katahdin staff, signed in and provided with a nametag and a “goodie” bag. The goodie bag held a Katahdin Plan Book, informational brochures about our company, a notepad and pen, and a CD showing the episode of ABC’s Extreme Makeover Home Edition that featured the Katahdin Cedar Log home built in 2005 for a local family. (Guests toured the Extreme Makeover home later in the morning.) Our guests were then invited to enjoy coffee, tea and assorted pastries in the meeting area. Representatives from Katahdin’s headquarters, as well as several Katahdin dealers from several different regions were on hand to help answer questions. He reviewed his background with the company that was started by his father with several others, and then fast-forwarded to present-day challenges and proactive solutions. 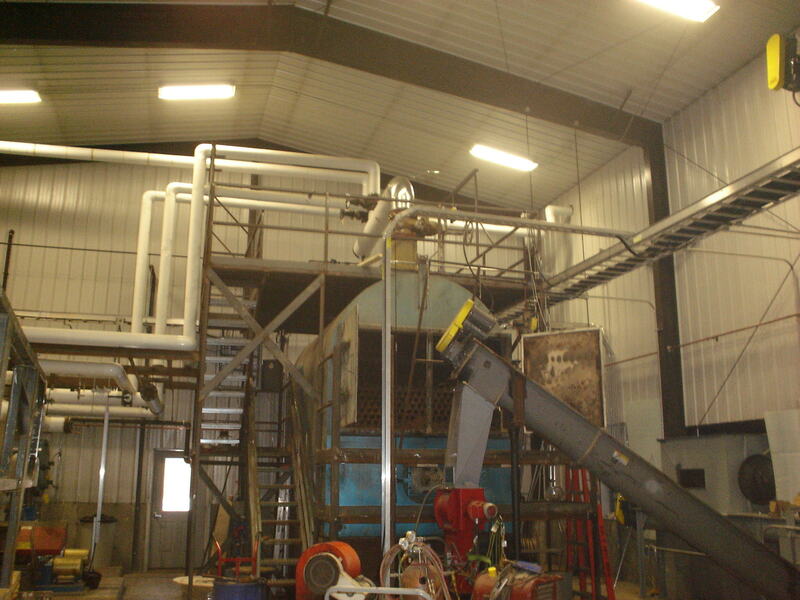 Gordon explained the “green” initiatives at Katahdin’s mills, including the biomass boiler, used to heat the mill buildings by burning waste sawdust and wood from the manufacturing process. Because of this single oversized boiler Katahdin is able to nearly eliminate its consumption of fuel oil for heat and kiln operation and saved nearly $400,000 the first year. One more use of waste materials from the surrounding area involves using locally grown potato waste to produce ethanol fuel for use in mill vehicles, tractors and other gasoline engines. The remains from that distillation process returns to farmers who use it for high-quality feed supplement for their livestock. Another topic relevant to today’s economic environment was Gordon’s emphasis and encouragement for buyers to truly compare among several different log home manufacturers before selecting one to contract with. Gordon explained that more than ever it was important for prospective buyers to conduct due diligence on several fronts, including the components included in the package, design capabilities and the financial status of each company. Additional information and package content comparisons were included in the goodie bags. 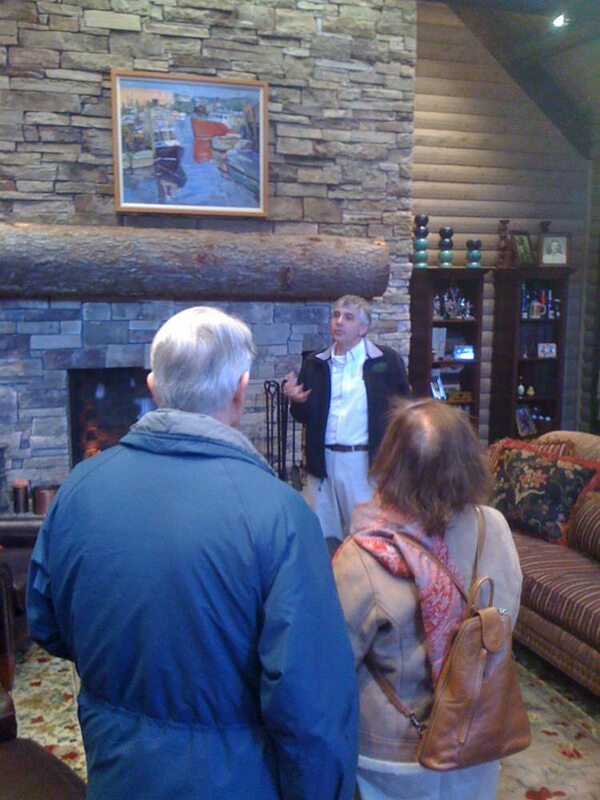 The seminar them broke to tour the nearby Extreme Makeover Katahdin Cedar Log Home. A large and comfortable tour bus was waiting just steps from the meeting room and all the guests boarded for the 10-minute ride to the nearby log home location. During the tour of the home, guests were able to see the completed Katahdin log home, ask questions and learn just how the 4,300 square foot home was constructed over the course of one week. The interior of this home was spotless and pleasantly decorated, so guests could imagine how it must feel to enjoy the log home lifestyle. Upon returning to the bus after a thorough and informative tour the group was abuzz with ideas and questions about Katahdin’s role in the television show as well as questions about aspects of the home’s construction. Upon return to the Village by the Sea, the second session of the seminar started. Katahdin’s Frank Gioffre, Sr., explained the multiple aspects of log home construction. Especially important for those who plan to build a home were the recently enacted energy efficiency building code changes, called 2009 IECC. These new regulations were tied to Federal “stimulus” funding through the American Reinvestment and Recovery Act. In most cases, these new laws have hit the log home industry especially hard as insulation needs to be added to the log walls to meet the new R-value requirements. Gioffre explained that Katahdin’s Energy Envelope System, which was introduced in 2008, meets or exceeds the new 2009 IECC requirements. Katahdin’s design team is able to price out the appropriate insulation required for any county in the U.S.
Other energy saving options to consider in your new log home include high-efficiency furnaces, as well as items that qualify for tax credit or rebates such as Energy Star appliances, Low-E windows and alternative energy sources like solar hot water or power. Gioffre noted that even if you’re unsure of whether you’ll eventually add solar, Katahdin is able to configure the home design so that rooftop solar units can be easily installed at any time. Gioffre also shared his experiences in building his own Katahdin log home and how he was able to define his needs both now and in the future. Many people use a notebook to collect and organize their ideas for their new log home. Gioffre had a spare bedroom where he taped up pictures, magazine clippings and oversized idea sheets to review, update and modify as his plans took shape. Many times, a small change to a plan can reap rewards down the road. Gioffre explained that he widened the hallways and doors in his home so that should he require the use of a wheelchair in the future, the home would be accessible with a few inexpensive modifications. The discussion moved on to working with contractors. One of the Katahdin dealers in the audience, Steve Howard, suggested that buyers ask for references in advance of signing a contract with a general contractor. He recommended that references include the last three completed projects, as well as those built 3-5 years previous. He added that reputable contractors are proud of their work and are happy to provide references. And those who refuse to provide references? “Run the other way,” he said. Gioffre then moved to an overview of financing, including how a construction loan was designed and how the construction “draw” functioned. With a construction loan, typically funds are released to the contractor based on either a timed schedule or based on completed stages of construction, with money released to pay for materials and labor. Once the building is complete a final mortgage note is drawn and recorded. Since the laws governing housing loans have evolved dramatically since the sharp downturn in the market, it is essential that each homebuyer explore the various options for mortgage loans available in their personal circumstances. One company, American Log Mortgage, specializes in log home financing, but Gioffre also recommended speaking with local lending institutions with whom you have a relationship. Most mortgages no longer require log home comparables for appraisal purposes, which once was a stumbling block for log home financing. Each seminar is a little different, depending on the guests in attendance, the region, the presenters and the current market conditions. Once the presentations and log home tour were complete, guests were invited to enjoy lunch and more specific conversations about their plans. The atmosphere was congenial, and for those who were seeking more information, the seminar was able to fill in many of the gaps in information. Keep your eyes open for the next seminar—we’ll be sure to alert you here in The View From Up North!